FACT CHECK: Did Barack Obama Visit Arlington Cemetery on Veterans Day? Did Barack Obama Visit Arlington Cemetery on Veterans Day? A circulated photograph of President Obama at the Arlington National Cemetery was intended as a contrast to President Trump. 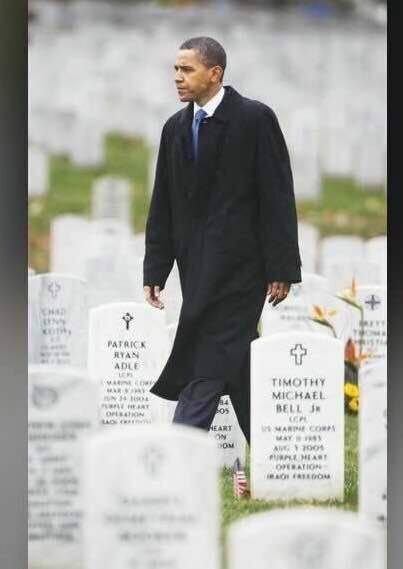 A photograph shows former president Barack Obama visiting Arlington National Cemetery alone in the rain in November 2018. President Barack Obama walks through grave markers in during a unannounced visit to Section 60 at Arlington National Cemetery in Arlington, Va.,Wednesday, Nov. 11, 2009. On a cold, rain-soaked Veterans Day, President Barack Obama walked slowly through the white, stone markers at the section of Arlington National Cemetery reserved for troops killed in Iraq and Afghanistan, the two wars he oversees as commander in chief. Obama on Wednesday observed Veterans Day with a traditional wreath-laying ceremony at the Tomb of the Unknowns at Arlington before an unannounced visit to the section reserved for those who fought in Iraq and Afghanistan. Before returning to the White House to discuss the Afghan strategy with his top military and national security advisers, Obama walked through Arlington’s Section 60, where fallen troops from Iraq and Afghanistan are buried. The president stopped at the grave of Spc. Ross McGinnis, a Medal of Honor recipient who was killed in Iraq, before he and first lady Michelle Obama walked through the rows of white headstones marking the fallen, the first president to do so while in office, according to cemetery staff. The Obamas shook hands and embraced surprised family members there to pay their respects, pausing to speak with them briefly beside the graves. He was at Arlington National Cemetery for Veterans Day, and after his remarks, made an impromptu stop at Section 60, where troops from Afghanistan and Iraq are buried. He paused to leave a Presidential coin in front of the tombstone for 19-year-old Medal of Honor recipient Specialist Ross McGinnis. Later that same day, the President held a briefing in the Situation Room on Afghanistan. Associated Press. 12 November 2009. The Washington Post. 10 November 2018.